Cruciferous vegetables (family Brassicaceae), more commonly referred as the mustard family of vegetables, or the cabbage family, are somewhat polarizing. People seem to either love broccolis, cabbages, cauliflower, and leafy greens such as kale, or completely hate them, finding them bitter and inedible. Interestingly, cruciferous vegetables contain varying amounts of a chemical called phenylthiocarbamide (PTC) that can taste anywhere from bland to extremely bitter and vile depending on the genetics of the person eating. I learned about this when my wife (who is also a biology teacher) had a student teacher who brought in some PTC tasting paper during a genetics lesson (see, sometimes you can actually learn something in school). Basically, if you can't stand the bitter taste of these veggies, it might not be your fault, it's in your genes (unless you're just one of those general anti-eat your vegetables people, of course, that attitude is probably in your genes as well - oh determinism!). The epitome of cruciferous hate seems to be the much maligned Brussels sprout, which is most often portrayed as the evil little veggie that you must eat if you want your dessert. My mother never made them that much, opting for other green vegetables, mainly broccoli and green beans and I developed such a bad opinion of Brussels sprouts that I don't think I actually tried one until sometime in my twenties. When I did I was pleasantly surprised that I liked them, but still failed to incorporate them into my diet. A few weeks back I wanted a side to go with roasted chicken and for some reason Brussels sprouts popped into my head. As I usually do when I choose to prepare an ingredient that I'm not especially familiar with, I turn to my preferred kitchen reference, Mark Bittman's How to Cook Everything. 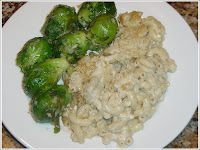 There was the usual excellent reference info, but only one sprout recipe called "Simmered Brussels Sprouts" which admittedly does not sound very exciting, but is really a very good vegetable side, and an excellent accompaniment to any roasted meat, or something like macaroni and cheese. For those of us that are not appalled at the presence of PTC in our food, cruciferous vegetables like Brussels sprouts, aside from being delicious, have a bevy of health benefits. Start by bringing a pot of water to a boil. Drop in the sprouts and boil gently until they just begin to soften up, about 10 minutes. Meanwhile, peel and crush the garlic, mince the parsley, juice the lemon, and measure out the bread crumbs. Drain the sprouts. You want to finish this dish just before serving, so if you're not ready to eat, hold the sprouts in some cool water, then drain again before finishing the dish. When you're ready, heat some olive oil in a skillet with the garlic. Add the sprouts along with the bread crumbs , toss to combine, and warm everything through for about 3 minutes, stirring occasionally. Add the parsley and lemon juice, season to taste with salt and fresh ground black pepper, and serve immediately.